Poland's Cardinal Jozef Glemp is playing himself in a film dedicated to Father Jerzy Popieluszko, the Solidarity chaplain killed by the communist secret police in 1984, producers said Tuesday. Amid widespread revulsion at the murder, Poland's then communist leader, General Wojciech Jaruzelski, took the unprecedented step of putting on trial the security police officers who carried out the killing. Captain Grzegorz Piotrowski and Lieutenants Leszek Pekala and Waldemar Chmielewski were sentenced respectively to 25, 15 and 14 years in prison, in a high-profile 1985 trial. They were identified thanks to the priest's driver, who escaped. All three are out of prison now, having been freed under an amnesty before serving their full sentences. After the fall of the regime in 1989, high-ranking communist officials believed to have ordered the priest's murder were also brought to trial, but acquitted for lack of evidence. 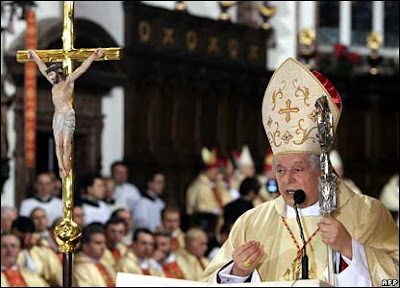 The Vatican began moves to beatify Popieluszko in 2001.